Editor's note: A gunman killed 10 people and himself Tuesday in southern Alabama. It's the most recent example of mass killing sprees that have traumatized communities over the years. Here's how one city responded. In the worst mass shooting in the U.S. at the time, a gunman killed 23 customers in a Texas cafeteria in 1991. (CNN) -- On October 16, 1991, 35-year-old George Hennard drove a pickup truck into Luby's cafeteria in Killeen, Texas, and fatally shot 23 people and wounded more than 20 before killing himself. For more than 15 years, the city next to the sprawling Fort Hood military base had the dubious distinction of being the site of the deadliest mass shooting in the United States -- until a student killed 32 people and himself at Virginia Tech in 2007. "You can never prepare for an incident like this," says Killeen city councilman Fred Latham, who was mayor pro tem of the city, which had a population of about 66,000 at the time of the shooting. But Killeen's experience shows a city can survive the grief, pain and stigma of such an incident. About 80 people were in the cafeteria, many of them taking their bosses to lunch for National Bosses Day when Hennard arrived. He methodically chose his victims, most of whom were women, before he was wounded by police and shot himself. Latham, who is 60 and a real estate broker, has been on the city council off and on for 16 years. He spoke to CNN.com Wednesday. CNN: What are your memories of that day in October? Latham: It was a tragic day in our history, Many of the people who were killed or injured I personally knew. It was just a big shock that anything like that could ever happen in our community. CNN: Where were you when it happened? Latham: I was with the mayor and the Waco city engineer, looking at potential road improvements and we just happened to be driving near where Luby's was, and we saw some roadblocks being set up and we knew something terrible had happened. There were police cars and barricades and you had the sense that something was wrong. CNN: What are your memories of the days after the shooting? Latham: The community came together as far as trying to help resolve the issues with the people who were victims or their families who were trying to get through it. There were a lot of human resource agencies that came, American Red Cross, a lot of counselors. It was just overwhelming. I think the phones into Killeen were jammed from people all over the country trying to check on their family members. 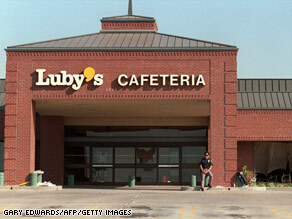 Luby's was the kind of place that would attract any kind of person. That was Bosses Day that particular day, so you had a lot of extra business there, I'm sure. And many of the people were in our school district. Our school district is one of the biggest employers in the region. So when you had administrators or people in that administration office killed, they're going to be known by many, many people. The commanding general at Fort Hood sent in helicopters and all kinds of extra assistance that might be needed. ...Fort Hood is the major employer in the area. At that time there were some 42,000 assigned troops there and some soldiers were actually killed. You can never prepare for an incident like this from somebody that just goes off. How they pick a destination you don't know. This person drove all the way from Belton, which is about 16 miles to our east. He wasn't a Killeen resident, so how he picked Luby's you don't know. He actually drove through the front window and the people that were in the restaurant thought maybe he had an accident where you try to apply the brakes and hit the gas pedal. .... When he came out shooting, the people were kind of trapped. I was proud of our community as to how they handled the situation and overcame all the adversity. Everybody was concerned about the welfare of the families and the people who were victims, Luby's began a fund to help defray some of the expenses and I think people from all over the country sent money. We formed a committee that helped look at how you disburse the money. I think that was successful and helped some with the aftermath. CNN: What are the emotions that a community goes through? Latham: Grief, just disbelief that something like this could happen, all the same emotions that you go through with any significant death in a family, I suppose. To have at the time...that this was worst shooting anywhere in the world, it gives a stigma that you don't ever want to have for your city. It's similar to the one that happened at Columbine and at Virginia Tech. Nobody has the answers as to why these things happen and the randomness of the person shooting his victims doesn't make any sense. It's not logical, you can't comprehend it. To see death happen to people, they were just there to have a meal with their boss and have a celebration of that and no interaction with the person that perpetrated this act. CNN: Were the churches and houses of worship involved in trying to heal the wounds? Latham: Absolutely, the churches throughout town came to the aid, performing counseling and having funeral services. There was a lot of compassion, if anything good came out of this, it was the fact that we realized that we all really cared more about each other more than we ever thought. CNN: Has the town recovered? Latham: It has been resilient. We've been in a dynamic part of central Texas where the economy has been good for many years. [There's] the resiliency and the strength of Fort Hood, which is one of the most efficient training facilities for the Army and it has continued to grow. A lot of people have retired here and the cost of living is good. There's affordable housing, the weather is good ... then you've got a work force that's educated and disciplined, and they're fairly young. CNN: You talked about the stigma of having the worst mass killing in the world. Latham: The tendency for the news media, each time an event like this happens, they'll list one, two, three, four, five, where the most killings occurred and you're mentioned in that top five. And that's not something we want to be reminded of. CNN: Some people say the stigma can hurt a town economically, but it doesn't seem to have done so in Killeen. Latham: We're a very mobile community. Our population turns over at least 30 percent every five years. Maybe two-thirds of our population [now] weren't even here or doesn't even know anything about this. So we're different from a longtime community that doesn't turn over like that. CNN: What advice would you have for other mayors or other city council people in towns who experience these kinds of incidents? Latham: Well I would accept help from others. You're not in it by yourself. You'll be surprised at the resiliency that you'll have as a community. The faith-based community will come forward, embrace that. You'll get through it, but you won't ever forget the victims or what has happened to the community.